The approx. 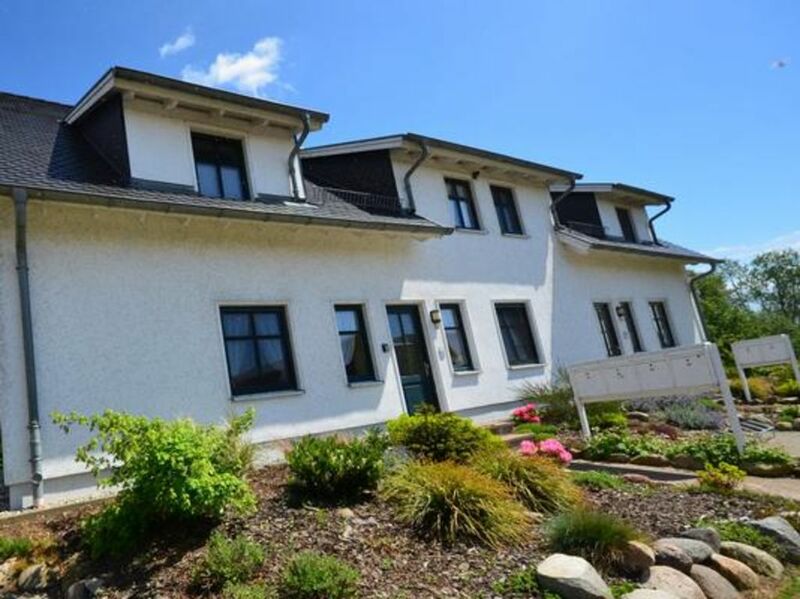 65m² holiday flat "Hiddensee" Auf Rügen ! for 2 or 4 persons and baby is located on the ground floor of a semi-detached house with 4 holiday flats. From the terrace the view goes sideways to the meadows and the Baltic Sea. The apartment is located directly at the nature reserve and the Baltic Sea. 1.80 x 2.00m large comfortable double wardrobe bed with latex mattresses, even if there is need, 2 additional people for an extra charge. The holiday flat Hiddensee is located in Groß Zicker, with one of the most beautiful island villages on the peninsula Mönchgut and was built in the year 2000 in solid construction with green bar windows and beaver tail - roofing. The granite flooring of the entrance area conveys an elegant impression. 1 shower - bath. Wall surfaces partly mirrored, hair dryer etc. Large living room (26m²) with rustic wood dining table and chairs crockery cupboard, satellite TV with approx. 40 programs, stereo, CD player, walls decorated with pictures. Exit to the terrace and view to the large garden, which borders on the fields to the sea. Terrace with terrace furniture, parasol, beach chair. For the barbecue time either a charcoal grill or electric grill is available. Kitchen: Beautiful new vanilla coloured country house kitchen, stove with ceramic hob and oven, dishwasher placed higher, 2 coffee machines, kettle, egg boiler, toaster, waffle iron, blender pressure cooker tasteful dishes. 1 bedroom: double bed, radio alarm clock, decorated with pictures, 1 large baby cot with bed linen included in the price. The infant up to 2 years can be brought along as an additional person free of charge. 1 storage room with washing machine and tumble dryer, ironing board with iron, 1 highchair. The rental price includes final cleaning, bed linen/towels and additional costs, baby cot with bed linen and highchair. There is 1 free parking space on the property. Very reasonable, partly half prices out of season. There are 2 normal coffee machines, a coffee pad machine "Philips Senseo" and a kettle in the house. As a welcome you will receive a bottle of wine and 5 coffee pads for the "Philips Senseo". You can buy the coffee pads in any supermarket, do not confuse them with the capsules of the manufacturers of the special capsule systems! 1 pitch is free of charge. Another pitch can be offered on request for 4,-/day. Telephone calls and mobile calls in Germany free of charge. International calls are unfortunately not possible. WLAN is offered free of charge in all our properties. The beds are ready on arrival. You will receive 4 normal towels, 2 shower towels and 4 kitchen towels. For 4 persons there are 8 normal towels, 4 shower towels. In the kitchen there is a sponge and a kitchen cloth. For the dishwasher we provide 6 tabs. The municipality of Gager levies a health resort tax, which has to be paid by the guests there in Gager to Höft 15a. The spa tax has to be paid in the period from 1.5.-30.10. Adults 1,50 € per day, children 0,75 €. The tax is reduced from 1.11.-30.4. for adults 0,75 € per day, and for children 0,37 € per day. Our caretaker will collect the registration form from you on Tuesday morning. Bicycles can only be rented for our guests for only 20€ / week. Electric bikes cost 60€ / week incl. charger and electricity. In Groß Zicker there is a small village shop where you can buy fresh rolls and bread. There are also several restaurants. Further numerous restaurants within a radius of 20 km. Large food markets in Baabe, Göhren and Thiessow. From Stralsund via the B 96 via Samtens to Bergen, approx. 2 km before Bergen then turn right onto the B 196 via Sellin, Baabe, Lobbe in the direction of Thiessow. Approx. 2 km before you reach Gager / Groß Zicker turn right after approx. 800m at the fork Groß Zicker - Gager turn left to Groß Zicker. The village Groß-Zicker on the peninsula Mönchgut in the southeast of the island Rügen is partly under monument protection. Most of the houses are thatched. The picturesque little village is situated at the Bodden (Watt) and is about 2 km away from the long snow-white beaches of the Baltic Sea. There is a normal beach, a dog beach and a nudist beach. The historical village street of Groß-Zicker has been renewed in natural stone to preserve the historical character of the thatched houses under the shade of chestnut trees. Worth seeing in the village are the parish widow house built in 1723, the small fishing port and the old village church with its wooden bell tower. The fishing village Groß Zicker is nestled between the Baltic Sea, the large reed beds, wide salt marshes, short grassy pastures. - dog / cat: per object and day Costs amounting to 5 EUR (optional). - 2.Stellplatz: per object and day Costs amounting to 4 EUR (optional). - Telephone: per object and day included in price . - electronic bicycle: per object and week Costs amounting to 60 EUR (optional). - bike: per object and week Costs amounting to 20 EUR (optional). - Visitor's tax: per person and day Costs amounting to 0.75 EUR (Mandatory). Pets (per property per day, included 5 EUR). Cot (per object and day, included in the price 0 EUR). Tourist tax (per person and day, to be performed by the tenant 1. 5 EUR). Tourist tax (per person and day, to be performed by the tenant 1. 5 EUR).